Tom Fuller and I have always had a cordial relationship despite the fact that his politics are Pelosi-left. He left a comment on the last thread in relation to taxes and the deficit which depicts exactly how the left-wing media is trying to portray our current debt situation. While he is refreshingly honest in his beliefs, they do not match objective reality. 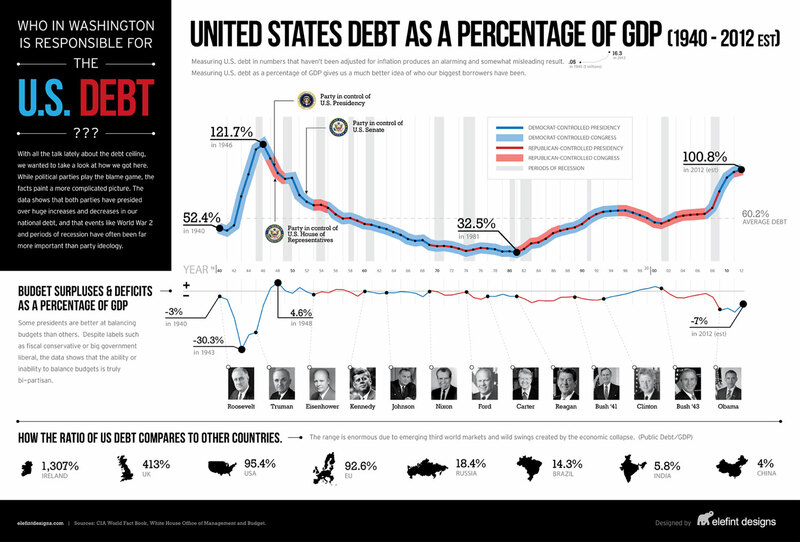 Now the only time in history that debt hit a higher percentage of GDP in the US was in WW2. I like this first graph because it doesn’t try to blame one party or the other for spending but it does show how serious the situation is in recent years. Everyone likes to hate Bush Jr. because that is what is popular today, but unlike most people, my beef with him was that he didn’t fight congress enough on spending. You can see that as a percentage of GDP, he barely tweaked the debt level until the last two years of his presidency when the Democrats controlled two branches of government and massive spending bills were passed under the false guise of “saving the economy”. The 2012 point at the end of the graph is an out-of-date estimate. So when you look at that plot, the only time we had a debt level this high was when we were in the middle of a world war. Not just an ordinary little war, a world-wide battle for our lives. The next graph shows the continual cancer-like growth of the largest and most powerful government in world history as a percentage of its populations Gross Domestic Product (GDP). Note that the plot is of “total government receipts” rather than the receipts from income tax so popular in leftist newspapers. Receipts from income tax have remained flat, and the media continually confuses its audiences with this tax fact that represents a small fraction of the picture. Total government receipts, is the Federal-only tax load on the economy in dollars, and does not include State taxes. When discussing historic tax levels, this is the majority of the real tax that you should be looking at, as these are the actual tax dollars being sucked out of the “free market” by our “limited” central government. Tom wrote – “We’ve had much higher taxes in the past and done just fine.”. While his opinion that taxes were “much higher”, is an admittedly widely held belief, it is flatly incorrect. The total governmental tax load on the US economy is the highest it has been in history, and as Tom pointed out, the future load already put into law is much greater. So the next time you hear that US taxes were much higher in the past…. Now there are a number of countries with higher receipts as a percentage of GDP than this, that the left likes to use as examples. However, these countries are either very much business repressed or in unusual economic circumstances like Denmark experiences, where exports provide the funding to allow a relatively successful left-wing society on a very tiny scale. I like the Denmark example because its often used as a counter example to a US style of government, yet it is comprised of 5 million people who are ironically dependent on oil and gas for their funding. There is nothing wrong with that in my opinion, but it cannot be scaled to function here as the amount of gas and oil required to support the same system for 300 million people would quite literally “flood” the market. You might even need an actual boat! We also have that little problem that the left seems to think CO2 emissions are killing the planet so instead of moving forward with common sense production of gas, there is great resistance to it. I like this next graph taken from usgovernmentrevenue.com. It depicts several of the primary sources of income for the US governement and you can see fairly clearly where the increases in figure 2 above come from. The blue line is total revenue, red indicates income taxes, green is business and other revenue, gray is ad valorum (property tax), and yellow is social security/medicare tax. Now we often look at the volatility of a timeseries while studying climate here, note the extreme fluctuations at the most recent end of the graph. These are caused by dynamics in the economy as the government borrows and spends to try and prop up our over-taxed free market economy. Notice the business and income taxes are the lines which create the recent short term variability in the total, not the social tax, and not the property tax. These taxes are profit based tax, rather than asset based. This fluctuation represents extreme losses of income in the private sector (loss of profitability). This income loss was unequivocally created by government loads on the economy which come in all forms. e.g. People like to say the housing “bubble” was the cause in 2008, but providing housing to those who couldn’t afford it, was just one of the many government loads created nearly exclusively by the Democrat party in the interest of fairness. Of course there are other examples as well but that one is a pet-peeve of mine. One theme here is that ever-tightening regulations are also taxes on the economy. These costs are true and real expenditures from business (taxes), and real checks are written to pay for them, yet the increases in cost are not shown in the plot above. These costs should not be ignored lightly but are difficult to quantify as they are not easily tracked. I find that today’s anti-industry climate makes the Democratic party completely deaf to the consequences of these realities, and while we are about to experience them in very clear and unfortunate economic terms over the coming decades, the yellow journalism of today will not discuss the problem. So now that we have figured out that taxes as a percentage of the US economy have never been higher, let’s look at the total government debt. Tom wrote, “We’ve had much higher debt in the past and done just fine.” This seems reasonable at first glance but let’s look a little closer at figure 1. In World War II, the US debt skyrocketed over 4 years from 52 percent to 121 percent of GDP. This expenditure was massive and I think even most Germans of today would admit it was necessary. Reading an expanded view of the graph, the WWII expenses took 16 years under a booming economy to pay them off to pre-war levels. Our net government revenue at the time was under 25% of GDP, and the hidden social/regulatory costs to operate a business were far lower than today. So in reality, we paid much less tax in the 50’s than today and it took over a decade to recover from the WWII expenditure in a booming economy. To me this indicates that Tom is right, we can recover from our current debt, yet in order to do it we have to bring government spending, anti-business regulations and taxation down dramatically. If we don’t reduce business regulation, the same government revenue means that you have a hidden net-higher rate than a numerically comparable rate in history. Let’s look again at Figure 3 above to see if we can tell what is responsible for our currently massive tax levels. After WWII, income taxes were increased dramatically. Overall tax rates were low enough that the economy continued to grow, yet this is the time when Social Security programs were enacted. Social Security was a liberal social program designed with the best intention and the yellow line represents the tax level for social security as a percentage of GDP. What I notice is a continued growth of social security income to nearly ten percent of the total economy before 1990. Visually this represents the majority of the federal tax increase between 1960 and 1990. I am pretty sure that we are fully stuck with the SS and Medicare tax for the foreseeable future, yet it is very clear that by looking to emergency spending of WWII, we are overspending in an unprecedented manner. Don’t forget that even with the high taxes, the social programs are famously under-funded. Together these plots show that we are currently spending more money as a percentage of GDP than we were in WWII and that taxation growth up to 1990 was largely a function of liberal social programs. In WWII, we were smart enough to stop the spending and rebuild our economy. At that time, we had reduced tax law that favored manufacturing and did not have the insane employment laws, environmental laws and compliance costs we have now. The plots indicate to me that nothing about the US situation is even remotely similar to history. The addition of an underfunded Obamacare expense to our budget is a guarantee that everything will not just be alright in the future either. To sum up, we have government expenditures in excess of a WWII scale, during peacetime, with nothing but increases in spending and taxation as far as the eye can see. What’s more is that the information in the graphs above, combined with the present recession, is a strong indicator that we are on the wrong side of the Laffer curve. Ignore that little detail at your own peril. This is also a complete misnomer often sold by left-wing media that many reasonable people believe. Gross Domestic Product is not “Income”, it is gross sales. The profit on GDP is Income, and it is a tiny fraction of GDP. The comparison is therefore a non-sequitur. If you sell a box of oranges to your friend for the same cost at which you bought them, how much of your personal GDP (gross sales) from the oranges, is available for payment of debt? It is more sensible to look at the national debt other ways. If we take the 16 trillion of debt and divide it by the 300 million population, we get a nice low number of $53,000 usd per man, woman and child. This is not a bad number to work with and doesn’t sound insurmountable by itself. Unfortunately, only working people pay taxes, and they only work for a fraction of their lives. Currently we have about 110 million employed people in the US which brings the total debt that working people owe to the government to 145,000 dollars per working person. There are about 110 million households so this is very similar to the dollars owed per household as well. But the annual deficit is what contributes to debt, and our government spending is so massive that and we are presently borrowing $10,000 per household per year. This means that every home needs to send $833 more per month to the federal government in taxes just to break even with our current expenses, and does not include the coming spending increases with Obamacare. Most readers will agree that that is a fairly huge amount of money for the government to be borrowing on our behalf during peacetime. Those households on social security would really need to tighten their belts to pay that bill. None of this includes the also massive debts being incurred by left-wing State governments like California and Illinois. Illinois currently carries a debt of 55,000/private worker for example. The financial situation of this country is terrible. The latest tax bill was full of payoffs to left-wing campaign supporters for Obama. I have never witnessed the kind of quid-pro-quo corruption of his administration, like Benghazi, that doesn’t even make a footnote in the media today. The media excoriates big business conservatives, then giggles as the Democrats hand out huge piles of cash to big business, right after receiving campaign cash from them. While people can interpret the numbers above differently, the range of reasonable interpretation does not include the possibility that what our government is doing might somehow be ok. It doesn’t take a rocket surgeon to work out what we need to do to fix it. It also doesn’t take much of a crystal ball to see what the future will bring if we don’t change our ways. Spend less, tax less, spend less, control less and spend less and we will all have a better future. This entry was posted on January 3, 2013 at 6:52 am	and is filed under Uncategorized. You can follow any responses to this entry through the RSS 2.0 feed. You can leave a response, or trackback from your own site. The comparison with a mortgage is, I think, inapt. The mortgage represents a leveraged purchase of an asset, and is based on the expectation that one has excess income (above what is needed for a complementary good, rent) with which to pay it off. In a reversal in which income is lost, one can (at least theoretically) undo that transaction, selling the house and paying off the mortgage. There’s no equivalent with our government debt — it wasn’t incurred to make a purchase (say, of land) which represents an asset on the books. A better analogy to a household would be if that household had ~100% of annual income in credit card debt, incurred to cover current expenses. That comparison makes the current high levels of debt sound much less palatable. Of course, government has a relative advantage that the interest rate is far less than a household would be forced to pay, which is to say that its risk of default is viewed as lower. Correct. The analogy should be to a household with 100% annual income in credit card debt and expressed as percentage of after tax discretionary income. Hi all. I don’t have my numbers prepared the way I would if this were about energy or climate, so my substantive response will be a bit slow. “Over the past few years, the federal government has been recording budget deficits that are the largest as a share of the economy since 1945. Consequently, the amount of federal debt held by the public has surged. By the end of this year, CBO projects that the federal debt will reach roughly 70 percent of gross domestic product (GDP), the highest percentage since shortly after World War II. “The aging of the baby-boom generation portends a significant and sustained increase in the share of the population receiving benefits from Social Security, Medicare, and as well as long-term care services financed by Medicaid. Moreover, per capita spending for health care is likely to continue rising faster than spending per person on other goods and services (although the magnitude of that gap is uncertain). Providing the health care services and retirement and disability benefits that people are accustomed to will consume a greater share of the economy in the future than it did in the past. Atlas isn’t just beginning to shrug, he’s nearly got it ready to fall of his shoulders. Jeff, As I am sure you’d agree, no single plot is good at giving a comprehensive understanding of taxation levels, revenue levels, and spending levels. Your plots here come close (and are quite good), but I have at least one disagreement. I imagine the end of the second plot shoots up because of how the GDP went down during the crash. That sudden rise doesn’t represent new taxes, just a lower GDP basis. And, if you back up right before the crash, then even in that plot you can still conclude that taxes as a percept of GDP were about as low in the 2000’s as they had been in many decades. Also, one can find analyses that do include state and local level taxes, and still rightly conclude that our total taxes are about as low as they’ve been in 40ish to 50ish years. Whether taxes have gone up, down, or stayed flat also depends a bit on which bracket. I think for the middle class they’ve been remarkably flat, but were lower for upper incomes in the last 10 years. I fully agree we have a serious long-term spending/entitlement problem (especially now that we’ve locked in the “temporary” Bush tax cuts), but the idea that we have been taxed ever higher and higher isn’t exactly correct, just as saying they are the lowest ever isn’t exactly correct. The latter is closer to correct, but its just never as simple as absolute statements. There was an editorial cartoon in the 1980’s of Reagan driving a cadilac with the words “US economy” on the hood. Some passenger was saying “sure, it runs nice, but how much debt are you running up to have this car?” I am not trying to blame him exclusively (we all know there was a Dem congress then), I am just saying this “propping up the economy” idea isn’t new, and this of course started 30 years ago. It won’t be stopped overnight. forgive me for getting a little sloppy in my comments on that second plot wrt spending and taxes vs reciepts…but the idea holds…the sudden changes at the end were from the scaling basis changing and some new crash-related spending. There were no new big gov’t programs (outside of bailouts and stimulus bill) or new taxes…the end is all the crash. Conclusions shoudl be based on the plot right before the crash. Also, it is interesting that you can see the Bush tax cuts in that plot, which do support the “taxes are about as low as they’ve been in decades” meme. This seems a little oversimplified too, don’t you think? The investment banks and lenders committed fraud. Fraud. This was not simply the pressure from Dems to loosen lending standards. The banks went far beyond that due to the money to be made in issuing mortgage loans and then repacking them as securities. The gov’t did contribute (via backing, even if the banks went below those standards), but the degree to which the bubble inflated, and the dramatic way in which it popped…was based heavily on fraud in the financial sector. Don’t lay all the blame on Dems. CDM, It is oversimplified but the government created the rules which the banks used to approve loans. Ross McKitrick has an excellent paper on all of the details which you can find at his website. I’ve never been convinced that government backing of poorly underwritten loans was not a primary cause of everyone believing in the “robust”ness of those packaged securities. It was a house of cards on a card table, the government is the one that said the table was made from marble. They most certainly did do this. The degree to which this caused vs merely added to the bubble and crash is open for debate, but the level of fraud or “willful ignorance in pursuit of profit” was significant. There may have been fraud involved but you could not prove that by the number of people tried and sent to jail. The easy money policy of the Federal Reserve has a lot to do with bubbles since money created above and beyond what it would be without the Feds interference tends to be mal invested. It is rather obvious that the banks were encouraged by the the government to produce loans for those who could not afford them. The reason those people could not afford them was after the fact when the prices of houses quit going up. Do you really think that the Federal Reserve and those politicians on the banking committees like Barney Franks who regulate banks were not aware of what was going on. What is the Fed doing currently in buying up mortgages with money it is printing? Banks are not going to expect to loan money to people who are going to default as that is a losing proposition all the way around. Now a bank might do that if they felt the government would bail them out if a risky investment, or a sufficient amount of them, failed. Now whose fault is it when people accede to moral hazard. Yes, few to none in jail over the fraud, but several billion have been clawed back on the basis of fraud already, and the private investor lawsuits are just ramping up. The story isn’t over yet. Hi Jeremy, I may well be retiring out of the country as well–in my case it’s due to a series of poor decisions earlier in my life. A little pontificating here… it seems pretty clear to me that Keynes was right in theory but never gets tested in practice. He said we should save money (run a surplus) when times are good and borrow money to keep the wheels of the economy turning when times are bad. But Democrats can’t normally keep their hands off the surplus in good times, so spending rises. And Republicans fight tooth and nail for austerity at the worst possible point in the economic cycle. Returning to the household analogy. 1) Saves money/food/assets during the good years. 2) Cuts costs dramatically during the bad years. More importantly, when a family hits bad years, what do the breadwinners do? They look for jobs anywhere they can take it, they lower their standards if they need to. Keynes was at least half wrong, using the same analogy you used before. A well-run household cuts spending dramatically to survive the bad times. Keynes believed that government spending was the only method by which money could be stimulated to flow again. I find this to be very shortsighted. There’s lots of ways to get money to flow again, most notably embracing deregulation. The democrats seem hell bent on enforcing more and more regulation of American industries, even in bad times. This behavior raises the standards by which income can be generated, it does not lower it. Hayek said quite notably that companies and economies don’t respond to financial crises well because wages become STICKY. Give a man a chance to keep his job for lower pay and suddenly companies become profitable again. When you throw in taxes on both employee and employer that are tied to wage level, you get an even larger problem. The U.S. has been operating on borrowed time on the world labor market. Our labor costs have been SKY HIGH compared to the rest of the world for 40+ years. Without massive deregulation and labor market freedom, the U.S. economy will never recover to what we’ve come to expect. We’ve been fearing depreciation of our currency for decades when we should have realized that currency (read: wage) competitiveness is what keeps industry in your home country. I’m not sure that any government — not just Democrats — can keep their hands off the surplus in good times. There are three possible reactions to a surplus: save it, increase spending, or reduce taxes. From Congress’s perspective, saving doesn’t win any friends. Reducing taxes brings smiles to voters’ faces. But, being (generally) spread broadly, I think that reduced taxes do not garner as much favor as increased spending, which tends to be more focused. Take, for instance, Congress’s recent extension of wind power subsidy. $12 Billion over 10 years. Works out to about $10/year/household. [Not that each household pays equally, but just trying to get the right order of magnitude.] Not a huge deal for most folks. But for the 75K workers in the wind industry, they now may well believe that their jobs were saved by the Democratic Party. [Although the provision was supported by Congressmen from both parties whose states have a large stake in wind, as far as I can tell the only opposition was from some Republicans.] Not to mention the owners of those wind companies, and their lobbyists. Now I realize that this instance can’t be used as an example of your premise — namely what happens when there is a surplus. But the point I’m trying to make is that spending gets a strong response from the beneficiaries of that spending, while reducing taxes has a much more subdued effect on the (far larger number of) taxpayers. It can’t be too surprising then that Congress tends to prefer the spending option. [I suppose the same argument can be made for narrowly-focused tax cuts, and that may help to explain the inordinate complexity of the tax code.] One ends up with a lot of special interest groups, each one smiling at its government-granted boon and not noticing the thousand small cuts inflicted to support all of the other special interest groups. California had a brief period between 2002 and 2006 of budgetary growth. What did the democrats in control of california do? They outspent their own budgetary increases by 2 to 1 or greater. I’m not exagerrating, they literally increased their deficit spending while given their best chance to buy down debt. So did Gordon Brown in the UK the worst chancellor and prime minister the UK has ever known, a miniature pygmy amongst towering dwarfs. Such is the state of British and European politicos. Jeff, as nice as you or I may think Tom Fullers is, what he says in the post in the introduction of this thread is just the wishful thinking of someone in love with big government who has not yet had to come to the realization and grips that we cannot afford the government we now have. Keynes was able to attract a lot of politicians to his otherwise seemingly contradictory ideas because he made what politicians had done in the past to grow government appear economically legitimate. Anyone with a wit of practical sense would know that politicians of before his time, his time and today do not save for a rainy day. The proof is there for anyone to see – if, of course, they really want to look. If the interest rates on our debt were not tied the safe haven concept of the US, our past performances and that other governments in general being viewed as more reckless spenders than us, we would have much higher rates and be closer to the fate that Greece has had to endure – with that being that a government no longer can meet payments on its debt. Obviously those who avert their eyes from our debt often neglect to speak about the unfunded liabilities of our federal, state and local government. Are our state and large local governments seen as too big to fail when their unfunded liabilities come due and they can no longer borrow or print money as the federal government can? Does that mean that their debts will be added to the federal debt? What about the many other moral hazards that we potentially now have based on the government’s willingness to bail out financial and auto interests in the latest past crisis. Obviously when we plied up large federal debt in the past our unfunded liabilities were much smaller and ongoing obligations for federal funds were much smaller. When debt grows and taxes grow with it, the economy suffers and the hoped for ability to grow ourselves out of debt quickly fades. Europe is facing this problem and to a lesser extent so are we in the US. The prime example of this effect is Greece where debt obligations have put that nation into a long term economic funk. Greece presents another example of things to come for other nations including the US and that is that their citizens are very reluctant to give up even small portions of the government largess they had come to expect to receive. People here in the US have come to expect the benefits of Medicare and Social Security and unfortunately depend, in too many cases, entirely on it. For those who want to deny our shaky financial condition and use the old adage of all that SS and Medicare require is some minor tweaking should think again and then attempt to remember why any changes to those programs has been aptly named the third rail of politics. Our financial advisor explains this by saying the US is “the best looking horse in line at the glue factory”. We are not really a good investment, but other countries are (amazingly) worse places to put your money. I always thought the expression was “brain scientist”. Let’s tax the top 2% of income earners at 100% of their income, enough money will be raised to run the governnment for 3 1/2 to 4 months, what about the other 8 months, who gets taxed next?? Okay, next, let’s tax the Forbes 400 richest people at 100% of their assets. Total net worth of this group is $1.7T, approximately the amount that the debt increased in 2012. Next year, debt goes up by more than $1.7, the year after, more, etc.The Forbes 400 have no more assets since we already taxed them at 100% of their net worth, whose estates get taxed next? Finally, let’s tax US businesses at 100% of their profits, which in 2011, were approximately $1.7T. If the businesses pay 100% of their profit in taxes, how much can they invest in their enterprise and how many employees can they hire and give jobs to? It is a fact that as tax rates increase, rich folks find ways to move their money to reduce their taxes so tax revenues may actually go down making an untenable situation even worse. No matter how you slice it, cuts in spending have to occur if our country is ever going to reduce the national debt and be on sound financial footing, again. Thanks for doing all that hard work. I will be relying on this post for months or even years to come. Bush II and Obama have been amazingly successful at emulating the European welfare states. Now why would anyone want to emulate a model that is failing almost everywhere? Greece is surviving on hand outs from Germany but even so there is blood in the streets. Greece is just one of the PIIGS (Portugal, Italy, Ireland, Greece & Spain), a group of nations in imminent danger of economic collapse. It will be interesting to see how long Germany will continue pumping money into failed economes. The day Germans say “Enough” the whole stack of cards will come tumbling down. Then there is the UK, my homeland, that is applying “Austerity” so the people are being forced to pay a much larger percentage of the cost of any health care they receive. Some services that used to be available for a nominal “Co-payment” are now 80% charged to patients. Countries that embrace the “Welfare State” concept eventually run out of money and find themselves unable to maintain public order which is the main legitimate function of government. Unfortunately, one of the defects of democracy is that the people can vote themselves all kinds of entitlements that will survive until bankruptcy intervenes. Another cautionary tale from the UK where the “Politics of Envy” has been flourishing for over 40 years. In the interest of “Fairness” (does that sound familiar?) taxes were raised on high income earners in the UK. I don’t follow many of the things being said here–sorry for my obtuseness. What on earth does the U.S. have in common with Greece? We have our own currency, for gawdssakes. We’re big. We make things. How come I haven’t seen anybody talking about the insane amount we spend on our military? I’m a proud veteran and support our military, but it’s too effing big. Does anybody here get that the 39.6% tax rate that Clinton had for top earners is a wee bit different than the 75% the French impose and whatever ridiculous rates the English are using? Well, that came out all wrong. I didn’t mean to be antagonistic. I’ll try again tomorrow. Tom, I’ll start with this rejoinder of yours and then go on to your other replies and note that you appear to be spewing clichés. Tom, it is not sufficient to say we (the US) are big and we make things and that somehow is how we will avoid the fate of Greece. Greece borrowed because as part of the EU there was the moral hazard that the EU (Germany) would bail them out and that kept borrowing costs artificially low. When people had second thoughts about that bail out because the EU nations were having financial difficulties suddenly the interest rates increased and the principle and interest payments were difficult to impossible to make. The US also benefits from artificially low interest rates just like Greece but for different reasons. When the lending public gets a whiff of the fate of the US if those rates climb and that the Fed cannot sustain them at low levels our borrowing cost can increase dramatically. Currently like the housing bubble it is feeding on itself and it is not sustainable – but we have plenty of people such as yourself unable or unwilling to recognize the situation. Defense spending is a significant part of the big government that we can no longer afford or sustain. The more critical question is why a liberal president has not made initiatives to make dramatic cuts in defense spending. We currently still have military troops in places like Germany, Japan, and Korea. I guess the Keynesian/liberal Democrat hesitancy is that cutting the troops would add to the employment rate. Our government is too effing big and the military is symptomatic of that problem. What I get is that big government advocates in reality care less about were the revenue comes from but rather it is a matter getting it somewhere and that starts with the sources that expend the least political capital, like the individuals with the greater incomes and lesser voting power they have and the sin taxes that affect the poorer more and because we have a Puritanical streak that makes those taxes less onerous to the voting public. We tax the faceless and vote-less corporations and businesses that in many instances can pass that cost on in higher prices to the naive consumer. I saw a CNN commentator go ballistic over a comment Rand Paul made in comparing the US to Greece and he spouted some clichés about the US just as you did, Tom. He even faulted Paul for his comments in that it might initiate a crises. The economist to whom the commentator spouted replied that maybe Paul should be listened to since the financial path our federal government is on is unsustainable. Maybe you should listen also, Tom, but I’ll not hold my breath. But in all honesty, I do not see anything unsustainable in what we are doing now. Not in real numbers, not in percentages, not in terms of mortgaging our future. My problem is that we are not preparing for expenditures we will want to make in the future. But consider our national debt from a different perspective. You are unhappy with the military spending (may actually be too high), but last year with record low interest rates (avg rate for the govt in 2013 was 2.79%) we paid $365B in interest alone. When (not if) interest rates return to their normal range of about 4.6% (averaged over the last 14 years) our INTEREST payments will be $765B on our CURRENT debt. If rates slip back to the end of the Clinton era, 6.54%, then our INTEREST payments will be over $1T on our current debt. Can you honestly believe we can ever afford even the interest on our current debt when the recovery starts? when interest rates go up, and they will, we will be Greece. We will be unable to pay our debt. Now think about the $5T that will be added to the debt in Obama’s next 4 years. Suddenly we are looking at interest payments (not principal, interest) on $22T. Pray really hard that interest rates never reach the 1979 levels of double digits. The percentage of the federal budget spent on defense is like 20%. The percentage of the federal budget spent on social entitlement programs is about 60%. 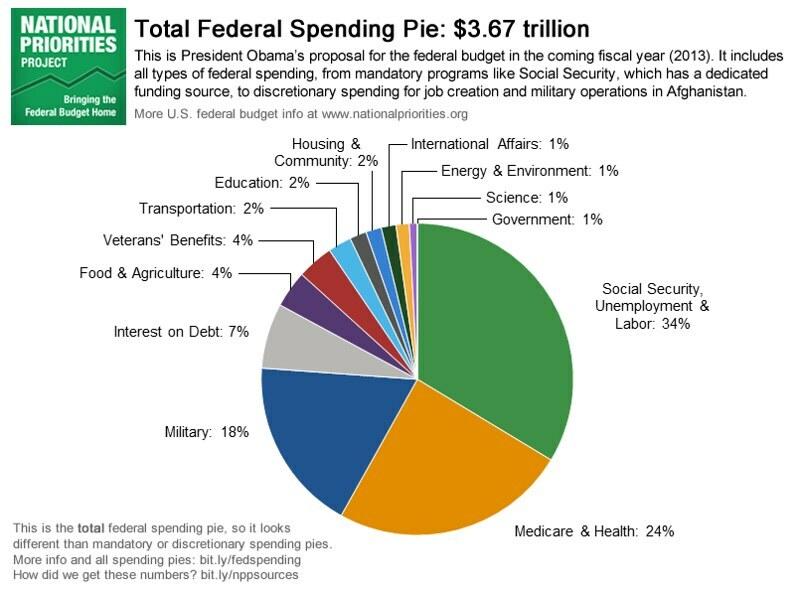 Which is a pie chart of all DISCRETIONARY spending (spending that must be justified before congress each year), however, that’s only a smaller portion of the total budget. Now, please consider what we get for our dollars. When you spend money on the military, you get technological innovation. Defense spending has ALWAYS attracted the best and brightest minds to develop military weapons and sensory systems that push mankinds technological boundaries. You can lump in most of NASAs early years into that as there were political-military reasons for the moon program. In short, spending money on military defense programs is an investment in our future, and provides lots of great entry-level jobs for science, engineering technology, and math majors. This in turn encourages young people in the U.S. to go for useful college degrees. What do we get from throwing money at the unemployed? What do we get from throwing money at those who failed to save for retirement? what do we get for giving money to those who don’t take care of their health? We get nothing but expenditures. Taking care of the sick and underperforming is only a drain on our present and future, there is no net benefit save keeping people alive for doing nothing. Some things are best discussed with percentages of GDP. Others are not. That wasn’t percent of GDP, that was percent of total expenditures which is a very different number. And comparing the U.S. to other countries is a complete conflation of numbers considering at least some of those countries benefit from our own military presence in their country. This fact raises our total expenditure and pushes theirs down. So exactly how is it more appropriate to compare us to other countries, particularly China which has a less-than-transparent government that is likely lying about how much they spend on defense. Returning to the household analogy yet again, what do you spend on protecting your family from the elements (weather/disaster), theft (security), and general well-being so they can sleep at night? Most people would acknowledge that owning a home or having a place of residence is the primary factor towards protecting a family from these things. Most families can spend 25-50% of their income on their home, security, etc… Why is it then strange that a peacetime superpower who helps protect numerous allies, spends 25% of it’s budget on defense, most of which spurs innovation for future consumer goods? I noticed you made no excuses for the 60% spending on social entitlements. I make no excuses for spending on social entitlements because I don’t think they need to be excused. China lies about its defense spending? I’m shocked.. tell me again about our black budgets for intelligence spending and which arm of our government handles Predator launches against the Taliban? I’m shocked.. tell me again about our black budgets for intelligence spending and which arm of our government handles Predator launches against the Taliban? Those budgets, by the way, unlike social security, unlike medicare, unlike all social spending, must be reviewed by congress every year. That’s right, no one takes a hard look at the progress or laziness or wastefulness of social programs each year, that money is simply spent. On the other hand, ALL classified military programs are in danger of cancellation if they fall behind schedule or go over budget. That’s simply a fact. I’m not confusing actors, you have called out military spending as being TOO HIGH. I’m telling you we spend 3 times as much on social programs, and social programs have no long-term return to the country. Now exactly what are we spending too much on? Look at how much GDP whogivesarataboutitstan is spending on their own national defense !!! Just for fun, could you please tell us of the 800 BILLION dollars of the 2009,2010,2011,2012 stimulus money goes to defense? Currently military spending amounts to around 6% of GDP. With no hot wars in progress spending should be trending down as in fact it is. If you think military spending is too high, what do you think about health care spending? Currently health care amounts to 18% of GDP or three times our military spending. By 2016 when Obama leaves office, military spending will be 4.5% of GDP while health care will account for ~20%. While we need to spend huge sums on both our military and health care there is one huge difference. Military spending is under control while health care spending is not. Thomas Fuller asks “What the USA has in common with Greece”? Simply put it does not matter how big your economy is if you can’t meet your obligations. The economy of Greece is small enough to be “Bailed out” by Germany. When the USA fails to meet its obligations there will be nobody with enough money to bail us out. When it happens we will have one thing in common with Greece……blood in the streets. Mr. Fuller is being absurd. There is a huge difference between borrowing money to pay for a war (an existential issue at the time) and borrowing to keep poor folks in cell phones. It’s like Twain says: if a man can’t deceive himself, who else is he going to deceive? I’d also like to know when abject fiscal irresponsibility became a part of left-wing dna. The disparity between our spending on defense and that of other countries has nothing to do with our recent wars. We really do spend more on defense than the next 10 countries and have for decades–with or without wars. I misread you. I thought you were referring to the relationship between debt and GNP as a result of government spending for World War II. You and I are on the same side of the picket fence when it comes to the Iraq War, which is in no way an existential war. I would add that the US spends a lot on defense, or more than we should, because some nations (Europe) rely on us to defend them. If you proposed that we revisit our extended foreign basing policy in light of changes in world affairs, I would happily agree. I enjoy your presence in these debates. You never speak intemperately and always manage to help everyone keep an eye on the ball. A class act through and through. About those bases (in Europe & elsewhere)? I have never been able to understand why many of them are still there. Most should be closed. In fact, I’ve been advocating a US pullout from South Korea just about all my life. I’m not a socialist. I’m a Democrat. I believe our country is stronger if we do spend some of our wealth on helping the poor and the sick. I’m not an idiot–I know a lot of the money is wasted (although I think waste is more common in defense spending). But I think Governor Christie’s dilemma should be clear to all. Social spending is not popular with conservatives–until suddenly it is. I honestly think we should spend some of the money you make to insure institutions like FEMA are able to minimize and recover quickly from the damage caused by natural disasters, whether or not you agree. Whether or not some of it is wasted. Whether or not you live in an area rarely touched by natural disaster. Tom, I didn’t mean to imply or suggest that you were, if that’s what you thought, please accept my apology. I believe the quote states the problem with out-of-control social welfare programs, as we see happening in Greece, Spain, etc. I believe our country is stronger if we do spend some of our wealth on helping the poor and the sick. Do you believe that 60% of the federal budget is too much? too low? Returning to the household analogy, do you know of any households that spend 60% of their income helping the poor yet still manage to raise well-fed and well-educated children? I don’t. At best I’ve seen people who spend 10% of their income, if that, and they don’t have kids. Analogies shouldn’t be stretched too far. But to reconstruct the analogy a bit, I do believe that many households spend similar percentages of their incomes on raising their own children and helping their families prosper. You I believe are confusing income streams in what is apparently becoming an increasingly tortured analogy. If you want to construct the argument that way, by all means. Lets pretend the children of a family are the poor. This would make unemployment insurance the money given to children when they’re out of work and must move back home. This would make health care the money spent on them when they get seriously injured and have no one else to care for them. This would make social security the money the kids spend keeping the old-folks alive I guess? 1) We failed to educate our children properly so they could get jobs, or we made no effort at finding them a trade. 2) We did not teach our kids how to eat properly and excercise. 3) We let grandma loose in vegas with her retirement money. Which, unsurprisingly, is extremely apt for what this country has actually done. When times get tough, do you tax the car more and let the house maintenance go by the wayside, the things that are required to keep the income and family structure going? Or do you tell those in the house who are mooching that they need to reduce their living conditions further? For the first 17 years of my life I was one of five children living in a household with one income earner–my father. The household income indeed fed and clothed us, insured us, kept our teeth in shape and a roof over our head. The income was adequate to send my older brother to law school. Sadly, there wasn’t enough left over for my education so I joined the Navy and started sucking at the government teat, or whatever you want to call it. My father’s hard work also extended to helping my mother’s parents financially. They were in Oregon, not Las Vegas. My father is now 85 years old. He’s writing another book–about prison reform and the people who made it happen. In all the years I have known him, he has never once complained about the burden he carried. I think he thought it was part of the deal. I tend to think he was right. How much of the people’s wealth should the state collect in taxes and spend as government officials think fit? But Depardieu decamped to Belgium, which collects 47% of GDP in taxes. He didn’t come to the U.S. to escape the tax man, as John Lennon did in the 60s. Somewhere between the United Arab Emirate’s 1% of GDP and Kiribati’s 70% of GDP is probably a happy medium. I would submit that your personal physical and financial condition will shape your preference more than your nationality or political party. I would offer Governor Christie as the reason why. Jeff wrote above that there are ‘several’ countries that collect more in the way of receipts than the U.S. The Heritage Foundation lists 61. Jeff also wrote that it was easy to see where increased revenue came from–but he fails to note that social security and healthcare taxes have climbed from 2% in 1940 to 7% of GDP today. Do we want to live in a country without unemployment insurance? Social Security? Medicare? Medicaid? I vote no. I’m willing to work with conservatives on fighting waste and corruption–hell, we liberals need you conservatives to keep us honest when we are in power (and we’re happy to return the favor when we’re not). But the overall structure of the U.S. social safety net looks sound to me. I think it could be stronger in some areas. I do not think our tax burden is too high. I don’t want to live in a country where despite my own sacrifice, merit and industry, I am forced to subsidize the life of those who want to be lazy. You can have all the social programs you want, as long as the contributions are voluntary. By forcing everyone to pay for others lack of motivation, you destroy any incentive to be profitable, particularly when this taxation of the profitable ramps up as you become more successful. Well, I would highlight the recent experience of Governor Christie as an argument against you. He was against Federal spending of the sort that he is asking for now. I would also say that he’s a politician, and politicians bend with whatever wind is blowing. I also laugh at his screams for federal aid, since allowing people to build high-value properties on sand-bars on the Atlantic coast was foolish to begin with. Florida learned this long ago. By and large, the majority of damage done by that tropical depression (not hurricane, not tropical storm, barely a major storm) was because high-value property was allowed to be built on unstable ground. It would be just as ridiculous if California’s governor demanded federal aid to subsidize the wealthy who build their homes on unstable sandstone cliffs along the pacific ocean and had their homes washed away by storms… yet as blue as California is, I’ve never seen this happen. But our taxes do help rebuild Malibu millionaire homes after fires and earthquakes. It’s just hidden better. No comment on the absurdity Tom? Just a counter-point that other people do it, so it must be okay? Tom… watch this video and tell me what you think. Jeremy, on occasion the government has supported me with your taxes–thank you. I wish that had not been the case and my overall contributions have exceeded my takings, but them’s the facts. For the record, I have never appeared on Judge Judy’s show. Your thank you is unnecessary and unwanted. Give me freedom from contributing to causes under pain of imprisonment or garnished wages, and you might gladly receive my help. The answers I have seen suggest that debt should fluctuate over the course of the economic cycle and that looking at debt as a snapshot percentage of one year’s GDP is not very helpful. If you look at the recent troubles experienced in Europe, Greece always looked like a disaster waiting to happen, but Ireland, Spain and Portugal did not. It wasn’t public debt that got them in trouble. It was the banks in Spain and Portugal and a housing boom in Ireland. What I believe is that the best way to crawl out from under a pile of debt is to quickly grow your income. I believe in this country that Democrats have a better track record of doing that. I don’t think current debt is a serious issue–if it were, Treasury prices would reflect it. I think Democrats in this country have a better handle on the scope of future unfunded obligations and understand that unless the economy returns to robust growth, we are in for big trouble. I think Republicans are too married to the idea of short-term tax cuts to be of much use in this matter. But heck–I’m a Democrat. Of course I’d say all that. It just happens to be what I believe to be the case. Tom, the Chemical Bank of America did a study that showed that economies tended to do better under Democrats than Republicans. It only went to Clinton’s admin. The current problem for both Democrats and Republicans is that the tax policy has been more about partisan positions than economic realities. That is why George W’s policies did poorly. At the time the Republicans were hawking about reducing capital gains and taxes on the rich, the economic reality was that manufacturing had about a 10% surplus of capability. The proper strategy would have been to reduce taxes on middle and low income groups and actually increase capital gains taxes, and taxes on the rich as to send incentive towards purcahsing, not investing. Obama and the Democrats have tending to do the opposite incorrectly as well. If there is insufficent capacity, but excess demand, it pays to decrease capital gains and taxes on the rich, and put taxes on the low and middle income instead, as well as cut social benefit packages. It is not that government cannot help the economy, it is that political posturing and buying of votes is done by both parties to the detriment of all. “Ever since Ronald Reagan first said it, Republicans have been fond of insisting that “we don’t have a revenue problem, we have a spending problem.” But it turns out that isn’t true. Let’s take a look at the raw data. Are you saying figure 2 is wrong?. It shows that we are outlaying more today than we did at the height of WWII – over 35% just in on budget spending. I would have agreed with that before this post, but the graphs of the data show the situation differently. GWB increased total dollars but ended up increasing the total outlay as %GDP only very slightly. It wasn’t until the Democrat congress convinced him to bail out the economy with massive programs in his last 2 years that the jump happens. — I’m still pissed about that. “The other big upward spike came in 2008, and it was purely a temporary result of the Great Recession. This is inaccurate. Spending went through the roof with Obama’s first bill. Check figure 2 of this post https://noconsensus.wordpress.com/2012/03/17/conservative-fantasy-world/ Note the spike when Obama took office. Remember how the “bailout” was full of corrupt payoffs to campaign contributors and new programs. He created a huge spending increase, which the health care bill will continue to expand. If you look at the numbers as I did, my recollection is that about 50% came from reduced income and 50% from increased spending. The recession spike of 2008 aside, it’s about the same as it was 30 years ago. In the year 1980, we were below 30 percent GDP, now we are over 35% – this doesn’t include state tax either. I saw the link to Kevin Drum’s blog and his data does not appear to be accurate either. If we are going to have a meaningful discussion, we need to agree that the data is accurate before making conclusions. I have done some checking of the data used here and I believe it to be accurate. If you request, I can look further but it seems fair for you to find the source of Kevin’s data then. As harold points out below, that does include state tax so I misspoke saying it didn’t include state tax. That doesn’t change a thing about my reply and it should still change Tom’s answer. Tom’s (well, Kevin’s) figures are for federal spending; your figure 2 covers government spending at all levels. That’s at least part of the discrepancy. Jeff, Tom before you accept any of these numbers or graphs, you need to check the 1983 OMB report. By executive order of Ronald Reagan, the US OMB was charged with using unacceptable accounting practices. The last time I checked, Clinton had proposed on going back to generally accepted accounting practices until he was shown what that would do to his supposed wonderful economic leagcy. With the problems the US economy has had since, I do not think we gone back to accepted standards. I could be wrong. I haven’t checked. I know in the Clinton years, when the Alan Greenspan of the Fed came in to discuss social security, he noted that use of proper accounting for social security would put the balance sheet into unacceptable regions for money lenders, and that although the social security debt was not a guaranteed debt legally, it was politically. He then sold a load of BS to Congress and the President on how we could continue not balancing the books and just postponing it to future politicians. Somewhere his written testimony is on-line and somewhere there is a critique of it that is well worth reading. You may need the wayback machine though. Hiya Jeff! Looks like a real discussion here! Your figure 2 has local and state spending. Drum’s is Fed only. On Drum’s chart, the GW Bush ‘spending spree’ shows as a very modest increase percentage-wise, so I don’t think there’s much of a difference between his figures and yours. Spending went through the roof in Obama’s first few months because of bailouts passed during GW Bush’s final months in office–and a good thing, too! True, and some of it actually went to something that made a difference (though most did not). The problem is that it has only climbed since then. It is only because of the record low interest rates on our national debt that it is not the largest line item in our (non existent) budget. Interest payments are tax monies that do not provide food stamps, or unemployment, or fuel for our military equipment, or welfare/medicare payments. If you believe in God, pray hard that we never see interest rates in the double digits again, because if that happens we will be Greece. The Federal funds rate in 1980 was 20%, that would mean interest on our current national debt of over $3T. Whoops! My eyesight really is going! I misread your comment. Yes, combined fed, state and local is above 35% now. But again, Drum is looking only at Federal. You wouldn’t believe the tax load on a manufacturer. We pay well over 50% and because of the required re-investment, my functional tax rate is in the hundreds of percents of my takehome. I literally write checks to the government that are far bigger than my annual take home salary but cannot take home the business cash as it is required to operate the business. And Obama just needs a little more. My points all stand. We are paying higher tax than any time in history. Manufacturers in particular face punitive taxes. The debt is massive compared to income and because our spending has exceeded WWII levels, with no end to the commitments anytime in the near future, America is in a great deal of trouble. The recession was responsible for about 50% of the deficit increase under Obama, not all of it, and the locus of possible interpretations cannot include that this situation is sustainable for any length of time. I think military is the wrong area to cut when we have things like DOE, EPA, ATF and the UN to work with, but I will take all of the above with a smile. Sorry Tom, your use of the second wiki link shows that you are completely unaware of how business taxes work. You also cannot ignore the fact that there are other taxes than income that taxpayers face. Figure 2 of this post is the one you need to refer to because it represents government load on the economy. We have been over this subject here many times. S corps are owned by individuals, they don’t pay tax. The owners pay on their behalf so all corporate income is reported on shareholder returns. 95% of companies are S corps, only a couple percent of them are functionally profitable to a reasonable level. 2/3 of the wealthy making over 450K, are actually S corp owners. My company income is on my personal return. In other words, Obama just raised taxes on a huge chunk of the business owners in this country and happened to catch a bunch of lawyers and professional athletes in the mix. The difference is that if a business owner took all of the cash out of their company, the company would close. So for 2012, I will pay a true tax rate on my actual takehome from my much larger, reported-yet-unspendable income, of hundreds of percent – not 20%. I wouldn’t lie to you about this. Your graph shows type C corporate tax I believe. C corps rates on average are going down because they are often large enough to influence congress and receive breaks. More importantly than that, they have the resources to manufacture in their own facilities overseas and hold profits there. They sell to the US at the highest price the IRS will allow. GE, apple and Microsoft are good examples and guess who they contribute to? This discussion is frustrating for me because you are making the claim that tax rates are lower than in history, which is flatly untrue (Figure 2), and now that the corporate rate is much lower than in the past, also untrue. You are making the claims because you don’t know tax law and because you are preferentially choosing to discuss a fraction of the tax (income only) rather than the total tax paid. C corps pay tax directly to the government. If a C corp owner later takes money out of the C corp (dividend), they pay full income tax on that money – a second tax – often at that high income tax level. (ouch!!) C corps are designed to live on the exchange with many shareholders and the execs take very high pay. S corps have a legally limited number of shareholders and distributions don’t get a second tax. Shares are harder to sell in an S corp because they are not centrally exchanged so investors are harder to find. S corp historic tax rates are very much incorporated into Figure 2 above. Interestingly, the meat-handed new law means that the tax hikes S corps just experienced, made private companies less competitive relative to giant public C corporations that the left so likes to excoriate. As a ratio, our company pays over 50% of our income in various taxes already. I’m telling you that these tax rates are suicidally destructive, because I pay them. You don’t have to believe that, but your claims that taxes are much lower than 30 years ago, are not supported by the data (figure 2 is taken from somewhere). 95% of corporations are regulated by individual income tax rates. The code is preferential to service companies rather than manufacturing. Only a few percent of the S corps are making the majority of the income – remember the presidential debates? These corps just received enormous tax increases – in 2013, in the middle of a recession we received increases of 4.9% after 400K of income, 20% increase in healthcare costs, 1% medicare increases, 3.8% increase for any investor profits in our company (e.g. if I or an outside investor work less than 500 hours for the invested company, for whatever reason, you pay an additional 3.8%), 5% capital gains on the sale of any S corp, and a large number of new compliance costs which the left literally never recognizes. All that and our customers are largely S corporations so orders have dropped about 30% since the election. I hope you will pay closer attention to what I am writing this time than a Wiki link. Our taxes are dramatically higher overall than in history-. Remember, what looks like ONLY 5% of GDP, is a huge fraction of profit. In the same manner as the 2.8% tax on gross sales of medical device manufacturers is really a 15%-30% increase on actual income. Hopefully, you find this informative. By the way–I would take all of the above with a smile, as well. Tom, after 4 years, I can say that I don’t take anything in blogland personally. Perhaps I am overconfident and if we were in the same room, I probably would just sit quietly. Engineers often discuss these sorts of details vehemently, many times we find ourselves wrong. In my experience, to an engineer we all enjoy the challenge. I believe I have provided solid evidence which refutes your tax claims. As a business owner who is being attacked with great vigor by the Democrat party, I do hope that people will listen. I woke up after the recent election and my wife was horribly upset. I told her that I was equally upset, but not for us. We will be fine. In a socialist system, it is the little people, the workers, those without cash or power who suffer. I was sad for those who we worked so hard to help. And that my friend, is the truth as I see it. Folks, you are making a big mistake in attempting to defend your partisan favorite politicians and allow the debate on the unsustainable debt to have a change in subject. The same goes for looking for nations who are worse off then ourselves and somehow seeing that as a positive for us. It is rather a lesson to be learned. The fact that a governor such as Chris Christy, who some might call a conservative, can have his hand out in a very political move, should not provide anyone with any consolation with regards the debt problem, but rather show that politicians of all political stripes are part of the problem. and that they play the crises game very well. Only Liberals would call Christy a “Conservative”. Conservatives would call him a RINO. Kenneth, what about our current level of debt makes in ‘unsustainable’? I would agree with you if you said something like we cannot continue to increase our debt at the rate we have recently. I would agree with you if you said that we are heading for trouble with regards to Medicare and Medicaid. But I see nothing about our current $16 trillion in debt that is insane or unsustainable in and of itself. I wish it were lower. But I would lower it by cutting defense spending, anathema to conservatives. They would lower it by slashing social spending, which I will resist. So it just sits there, a lump of debt. It’s not good. It will constrain our options in the future. But unsustainable? I don’t think that’s accurate. Again with the imperfect analogy–if a household has an annual income of $130,000 and has debt of $160,000, they can still have a perfect score with Credit.Com. It depends on what else is going on in the household, right? Average household income is below 50,000 and likely a weak credit score. They usually have their own bills too. How are they going to pay 160,000 in federal only debt with that? Hi Jeff–I’m comparing the federal government to a household. U.S. GDP is $13 trillion, debt is $16 trillion. I’m trying to say that (although not exactly equivalent for obvious reasons) there is no more need to panic with our level of debt than for a household with $130,000 income and $160,000 of debt. It isn’t exactly the same thing–I know. But the rough comparison should provide some perspective. Your household analogy is confused. The governments income is not $13T, the Governments income in 2012 was $2.3T. We borrowed (according to the CBO) an additional $1.3T. I don’t want to respond on the half dozen threads we have going but you need to understand that “exactly the same thing” is not an accurate statement. They are completely different. GDP is NOT income. You cannot spend 100% of GDP, because there is not 100% to spend. You have to subtract material costs from GDP, including any physical item used to create that GDP. Energy, buildings, materials etc…. The GDP comparison to household income is false, and you shouldn’t ever make it in the future. I hope we all live long enough to see who is right in this debate. Folks on the left think nothing is wrong with current spending, and, in fact, want to spend more. Is there anything people on the left think government should not be doing? The Fed has literally flooded the market with borrowed money. This has bent the normal levers (risk, supply-demand, interest) into Gumbi levers. Just about every major bank in Europe is insolvent. The stock market is so far removed from reality it’s pointless to pay attention to it. Why is it up? Ask Bernanke. He wants it up. We can talk about debt and numbers and percentages until the cows come home. Fact is, because we refuse to face reality, we are doing what every other fiat currency nation in history has done, printing money that is backed by nothing. Now, I still don’t understand why we haven’t already collapsed, so what I say should be taken with a grain of salt. But if anyone thinks that what happened in 2008 can’t happen again, he better think again. And this time we will utterly collapse because our money is increasingly worthless. It is beyond my understanding that anyone could think our spending is ok. It simply isn’t a reasonable position. I am paying multiples of my income in tax this year, I hope to do the same next year but in this economy there are no guarantees. Tom if you are looking for rationalizations for ignoring the debt problem be my guest. You have lots of company. When you are ready to lift your game to the next level let me know. First of all it is silly to compare a household debt with a government debt. Those debts operate under entirely different sets of rules. With a household the largest source of the debt of the magnitude you show above is for a mortgage. That mortgage debt counts as a minus on the balance sheet of assets and liabilities and if the home is worth more than that debt the household has a net positive on that account item. If a household or individual has a negative net worth then at some point borrowing is going to be an issue and if becomes sufficiently negative an individual bankruptcy can occur. The debt of a household would not have future obligations that are growing out of hand like our governments because its borrowing abilities would be curtailed. Households cannot print money or coercively collect money from its neighbors like the federal government can and that restriction keeps households and individuals spending in check. There are no such checks on government, and since Keynes has provided a legitimacy for irresponsible procurement of government debt, politicians have pretty much had a free hand with spending and particularly in those cases deemed crises such as wars and economic downturns. What keeps the borrowers at bay and interest rates low enough to sustain these rates of debt accumulation is that the borrower remains convinced that that debt will not be defaulted because the government will tax (and tax at rates that could depress the economy for years if not decades just as has occurred in Greece) and/or print their way out of a debt crises. The choice for the government populace between taxing at rates that kills economic growth and/or printing money and experiencing very high price inflations is not pretty. And, of course, Tom, your pronouncement of being a Democrat and probably a partisan one, would remind me to remind you that when the previous Republican administration was running the debt up with deficit spending there were many in your party complaining about the debt. My point about partisanship is that when Democrat debt is good/bad and the same for Republican debt, depending on your partisan position, the politicians in both parties have a leg up in increasing the debt. As a footnote I have attempted to determine the Federal government’s net worth considering the value of its assets versus liabilities and as I recall, even without the unfunded liabilities it has for future payments, its net worth was negative. So Tom in comparing the household with the federal government I think I have shown it is apple to oranges unless you consider the household that can steal from its neighbors and run a printing press in its basement. But Kenneth–our economy generates about $13 trillion in GDP each year. We’re paying very little in interest on the money we are borrowing now. Our economy is growing. As it continues to grow the automatic stabilizers of unemployment insurance and food stamps will decrease. Our creditors understand that. Our fiscal position will improve over the next decade, until increased healthcare obligations start to crowd it out. But, Tom, the very improvements you predict will change our annual interest payments on the debt from 350-450 Billion a year (the range of interest only on our national debt during Obama’s reign so far is $359-454 Billion a year (the low number was a result of a one year special refund by to the single largest line item in the budget. That’s interest, not principal. Can you actually tell me when the INCREASE in the debt will stop? I’m not asking for when we can/will actually start to REPAY the debt, but when the increase will stop? As I said previously, what are we going to do in 2016 when interest rates have recovered (back to the average of 4.6%), and the INTEREST on our national debt is $765B, the largest item in our budget (assuming of course the idiots in Washington ever actually PASS a budget)? Let’s pray that the economy does not actually do a strong rebound and interest rates jump up to the Clinton level of 6.5%, then the annual interest on our (conservatively) debt of $22T will be $1.4T. Let’s look at that again, if our economy rebounds to the Clinton era levels, our government will have to pay about 6.5% for it’s debt service (most of our current debt is very short term notes, so they constantly have to resell bonds). if our idiot government keeps listening to people like you that it is not a problem, then in 3 or 4 year when interest rates recover, JUST the interest on our national debt will somewhere North of a Trillion Dollars. And let me ask again, can you actually foresee a time when the debt will NOT continue to increase? (be careful of the 2012 number, there was a one time reduction of $50B (I think, it was in the monthly data, but I cannot find it since they went to annual numbers)). If one accepts our President and his current administration as lying within the normal range of political thought and having a normal level of concern for our country, their own reputation and their place in history (and I do–for all of the above), then it would be fairly normal to conclude that as the situation changes economically in this country, so too will their policies. That is certainly what I think will happen–not least because a Republican House of Representatives will hold their feet to the fire, should they show any reluctance to change. It is only if you hold an extreme view of Obama that you end up in this ideological cul de sac. Our economy is not growing anywhere near what would be expected at this stage of a recovery. Many people have left the work force and that has made the official unemployment rate look better than it otherwise would. Many more people are receiving disability payments from the government and that no doubt is influenced by the lack of employment opportunities as is the case with food stamps. If the economy recovers at a significantly faster rate (and it certainly could dispite unfavorable government policies) those people might be enticed to come back into the work force as people seeking employment. You will then find out what the true unemployment rate is. An alternative to that is that those people will not be enticed to come back to work which keeps the unemployment rate lower but now you have fewer people paying taxes and more people depending of government payments. Also Tom, I was attempting to show you that, governments, as opposed to private parties, can have a very negative net worth and continue to borrow at reasonable rates or at least for now. There is only one reason for that: the government has the power to coercively take money from the public and/or print money. If borrowers thought that there was a limit to what our government would do to raise revenues, interest rates would be much higher. The first is the fallacy that WWI got us out of the great depression. True, more people were working, but they were producing stuff like tanks, bombers, fighters, destroyers, artillery shells, and other non consumables. Consider the effects of RATIONING, rent controls, etc. and people were actually poorer than they were during the 1930s. We didn’t actually get out of the great depression until 1945. The second argument, made frequently NOW, is that by running up debt, we’re making our children pay. Again using WWII as an example, all those factory workers got paid big bucks, a lot of which they couldn’t spend due to rationing. Once the war was over, prices shot up. That inflation was in effect a tax on all the savings accumulated by individuals during the war. It wasn’t actually future generations that paid for the war, it was those living through it who paid in a lower quality of living during the war. Likewise, we’re paying right now for the trillion dollar a year deficits. We’re paying with high unemployment and a stagnant economy. It looks like we’re now living in a new Obama raw deal. You can expect a stagnant or declining economy as long as we practice Obamanomics. Alan, I agree with what you meant by this statement and I know you meant WWII not WW1. Alan, I’d like to take exception with your point about it being “fallacious that running up the debt is going to make our children pay”. Yes inflation and economic growth will change our economic situation, but it will also dramatically change the cost of our enormous debt. Our children will be the ones who end up paying a Trillion dollars a year in interest payments alone. At this point, the only thing keeping our government from bankruptcy is the abnormally low interest rates. When those rise (and they won’t have to rise much) and all of that short term debt at 0% gets reissued at 2-3% (still a historically low number) our interest payments will go from the current $400-450B to the largest piece of our governments annual expenditures. I think that even when inflation causes revenue to increase and reduce the deficit (I am also pessimistic that it will reduce it enough), it will be more than offset by the huge increases in servicing our ever increasing debt. Pray really hard that we don’t ever return to the 15-20% interest rates of the early 80’s. Yes, the economy will recover, but the debt we have incurred is unlike ANY historical amount, as are the massive, continuing increases Obama is racking up. E.M.Smith posted a stimulating piece on the Russian economy. It seems that they expect to sustain their high rate of economic growth by means of low personal and corporate income taxes. The USA seems to be headed in exactly the opposite direction. It will be interesting to see how that juxtaposition plays out. “This study examines the international growth rates for 103 countries between 1960 and 1980. 1. On the average, countries reach their maximum economic growth when they take no mre than 19.3 percent of GDP in taxes. 2. The economic growth rate tends to reach zero and then become negative once taxes consume more than 45 percent of GDP. 1. A country that chooses a tax rate of 43.2 percent (to maximize revenue) rather than a tax rate of 19.3 percent (to maximize growth) will see its growth rate plunge from 2.4 percent per year to 0.4 percent on the average. 2. The burden of the “growth tax” (causing a lower standard of living) exceeds the amount of th edirect tax in only 20 years. It’s not just that the current rate of spending is unsustainable, it is also a question of what that level of government involvement has on the society. It’s been said over and over but increasing taxes does not necessarily increase revenue. But even if additional revenue is generated the costs to our society often outweigh the benefits. Loss of efficiency and reduced national production are often the result. Government can not do anything efficiently, competition is needed for that. The private sector aka free market, aka capitalism best maximizes efficiency and satisfies true needs. Phones, TV’s, Computers……private enterprise. When government allocates resources it is more often does so in places they are not needed and certainly not efficiently. Amtrac, the post office, solar, wind farms, ethanol….big government. Now here is the biggest problem with government spending. The government is filled with people like Tom. They believe the governments mission is to help us all succeed. When it’s not working we need more government assistance. But it never works as good as it should…. never…. so more help. And if something does work …well… see how good our government is working. The need justifies the action and the success or failure justifies more action. The one question a big government advocates cannot and will not answer is when have we spent enough. And if the consequences were simply inefficiency and creeping government expansion the trade off could be acceptable. But the corrosive effects this has on the society is the biggest problem Building a dependent class is harmful. Mostly to the poor. And that dependent class doesn’t just include those receiving government support. The dependent class includes the massive amount of people reliant on government for there livelihood. Not just government employees but also ancillary private companies reliant on big government for there business. And now we reach the point where government growth cannot be stopped because too many have a stake in it. Things work despite government help, and would work better with less help. Can’t we at least stop the growth of the dependent class or even shrink it just a little. Does anyone think the current crop of Dems would even consider that. Tom is right about one thing ( sorry just one) We are not Greece. Our fiscal problems are the worlds problems. Are we going to eventually fail? No, but we will be less productive and prosperous. Those most hurt will be the poor. The poor in our country and the poor around the world. Some of us will blame over reaching government. Democrats will blame Republicans and Bush. I read the paper this morning. It was interesting except that I couldn’t tell where the numbers came from. EDIT: I read where they came from, but cannot asses the quality of the result. It does sound plausible though. This discussion should be clear on separation of the potential for economic recovery and economic activity and the government debt that could become a crises in the face of a high level of economic activity. Probably more by luck than skill I have been able to invest with reasonable success with bets on what the Federal Reserve was going to do. I look at the economy from an Austrian school of economics point of view. I see the boom bust cycle of these advanced economies as a result primarily of the Federal Reserve and other nations central banks attempts to use monetary policy to control the economy. In good times the central banks maintain interest rates too low and this promotes mal investment because the savings rates does not correspond to the money available for investment. In the more extreme cases that mal investment can result in bubbles such as we saw go bust with the housing market. The central banks provide that money out of thin air and those who first are able to invest it tend to be the winners since later if there is price inflation and/or if the economy starts going bust an investment loses the advantages of the earliest ones. Once we go into the bust part of the cycle or even merely an economic downturn the government and the Feds attempts to alleviate the extreme affects of the cycle only delay the correction from the mal investments that is required before a recovery can take place. Often these policies make the recovery take longer and be more painful than it would be if the government and Feds did nothing. Our current economic malaise and the length of it in some sense is a good sign because it means that mal investments of the past are being liquidated and a correction is occurring albeit over a longer period and more painfully than it need be. The Federal Reserve with the leadership of Ben Bernanke, I judge is very much into pushing the economy into another boom period and I feel they will be successful. From an Austrian point of view this is not a good thing since it will be followed by another bust and likely a big one as much depends on how much of the mal investment from the last boom is actually liquidated. Busts are what exposes our irresponsible accumulation of government debt and each succeeding time puts us closer to a default on debt or alternatively some very painful and economic burdensome tax increases and perhaps even reductions in government programs. In summary, even in the face of an expanding economy the government debt situation does not necessarily improve and does in no way mean we can breathe easier even when that might appear to be the natural tendency. Greece’s economy was expanding and so was that of Iceland’s and Ireland’s. Very little to disagree with in this comment. Potential problems with debt? Yes, of course. I’d just point out again that a debt crisis is not foredoomed. While the more fiscally conservative and libertarian posters here might well paint a picture that there is a debt crisis, Tom Fuller’s comments are more in line with the popular opinion out there and what is backed by the prevailing intelligentsia, perhaps best exemplified by Paul Krugman. The accepted Keynesian line is that we actually need more debt and more printing of money. Like most big government advocates when a policy fails the simple answer is that we need more of the same only in spades this time. How farsighted are these Keynesian thinkers? Keynes himself once commented when questioned on where his policies might lead with “in the long run we are all dead”. Big government politicians use the intelligentsia cover to ever increase the size of government and without having to admit to being irresponsible to themselves or their constituencies. It becomes rather an easy proposition for those not indoctrinated with a big government philosophy to see what is currently happening and where it is headed. Unfortunately those warning signals will not be heeded until we have sea change in prevailing intellectual thought processes. I am, in fact, both a fan and frequent reader of Paul Krugman. I do agree broadly with his prescriptive writings about what central bank policy should be in an abnormal recession such as faced by the U.S. I think he shows with both theory and past practice that deficit spending in this type of situation is a good idea, both short and longer term. As I noted above, the problem with Keynesian approaches to economic policy is that they only work if pursued diligently throughout the economic cycle. Deficit spending in a liquidity trap is valid–but must be balanced by budget surplus when the cycle turns. It is rare that this happens, due to political considerations. But that doesn’t mean that Krugman is wrong. Are you just making these kind of statements to tweak conservatives. Even you have to know that Krugman is one of the most despicable and dishonest political hacks on the planet. Where are these “calculations”. The man hasn’t had a cogent thought for years. They used to say the same thing about communism. Krugman is an ideologue, nothing more. Like a global warming scientist writing what his fellow warmists want to read, economics is polluted with left-think that pressures better economists from the main stream. If you want a better economy, you need to take the liberal foot off the throat of business and any other argument is sophistry. If business can produce under less than ideal circumstances, it will operate to a less ideal level. It is that simple. I don’t know how people get so confused about “production of goods and services” that they actually believe the government drives business. All of these outside influences (rule changes, taxes, credits) simply serve to destabilize the natural balance point and since our government has only gone in the direction of more rules for the last 4 years, that balance point is pushing in the direction of a reduced economy. Fluctuations about that balance point are fodder for public (and economist) confusion. Oddly enough, that also correlates to the situation in AGW science. “…any other argument is sophistry”. Jeff, from what I’ve seen, read, and been told, I respect what you do on climate science. But, with all due respect, when it comes to politics, economics, and taxation—which are not black and white subjects—you sound about as objective as the IPCC on climate change. It seems you know the answer and thus know any philosophy or evidence that gives points to the contrary must be flawed. I’ll end on a friendler note by acknowledging that I have still benefited from your perspective on a few things…namely on how the taxes on a mid-size mfg business are much more burdensome than on a small professional services business. So I guess that’s been a gain for me…but think I’ll try to stick to reading your climate posts from here out. CDM, The truth is the truth and the business of economists is just as corrupted as that of climate science. The arguments posed against business are sophistry at this point. Certainly if we were a lightly taxed country, we could discuss benefits of more taxing and spending but we are in a ludicrous situation and Krugman has people convinced (confused) that the situation might somehow be ok. It is not, and arguments to the contrary don’t hold water. I’m sorry if they don’t comport with your previous beliefs but I must live in reality at all times. If any of Tom’s points above on taxing and spending had merit, I would gladly change my mind. 3 – our deficit is massive compared to our income. GDP is not income. Arguments to the contrary cannot avoid these realities. Tom, indeed, Krugman gives intellectual cover for the politicians in Washington and he gives big government advocates, as I assume you are, a way of feeling better about all the accumulated debt. When Keynesian policies appear not to work what better to hear for big government advocates than we need to spend more and increase debt more. Krugman a few months back was wishing for a threat of a space invasion so that the federal government could spend on preparing for that threat knowing full well that such as threat would be an illusion. He was making a point and a Keynesian one at that by being a bit facetious but nevertheless his point was clear. Spend that money for no productive or necessarily reasonable purpose but simply spend it. What better for the politician, who is motivated to buy votes and practice crony capitalism, to hear than that. Obviously Krugman was attempting to be more political correct in a leftist mentality sort of way by not advocating for a war to throw money at as in another approved Keynesian way of stimulating an economy. The website mises.com does an excellent job of refuting Krugman’s arguments and is particularly good at pointing out how he can misuse and misrepresent economic data. Somehow, though I doubt we will find you reading there, Tom. That should be mises.org not mises.com. I wish people would stop using the phrase “crony capitalism.” It is a liberal (progressive, collectivist) way of describing what is ultimately fascism but with an implication that there is some dark underbelly to capitalism. It is simply false – in a capitalist system, there can be no cronyism. I would agree with you that in a truly capitalistic system there would be no way for the government to provide favors to their cronies in the business world, and further that much of what modern day liberals like to blame on capitalism arises because of government intervention and sometimes in indirect and not obviously apparent ways. People who are economic illiterates, and that would include most politicians, I suspect will not be influenced in their thinking based on the terminology used. After all the term liberal as in classical liberals was used to describe those who favored less government control of the economy. I may not be able to reply (depending on the weather) I have taken my own advice and sailed away, but I will if I can. Regarding Denmark: Are you sure you’re not mixing up with Norway? The oil and gas industry of Denmark is less than 10% the size iof the Norwegian. Sweden has none at all and is larger, so it might be easier to compare with the US. Denmark is #32 in the world for oil export. Considering they are a population of 5 million, that is substantial. Norway is fifth with a similar sized population. Interesting that these alleged left-wing heavens are living on the consumption of the rest of us. In reading these comments, government spending is like taking water from a pool in a leaky bucket, carry the bucket down the side of the pool, spilling water on the ground, then pouring what’s left in the bucket back into the pool. Only a liberal would call that positive government spending. The point people forget is that the money the government spends comes from somewhere, either taxes or borrowing. With our “forced” low interest rates the pain of high debt looks sustainable to a liberal mind. The devaluation of the dollar to keep the interest rates low are also a drag on the economy, as it raises prices on everything for everyone. Once interest rates go up, and the Fed can only spend so much before they do, the government will either have to raise taxes to pay off the interest or borrow to pay the interest. The absolutely astonishing thing is the government never actually cuts spending, the Washington speak for “cuts” is just a reduction in future spending rates. True, growing out of a problem is possible, but not with policies that retard business (job) development. Poor long term tax policy, unknown Obamacare rules (which are still being written and also apparently changeable by Executive Order), the threat of EPA rules, restrictions on energy development on Federal Lands, and more and more regulations are holding business back. No sane business owner is going to ramp up when demand is not there, unless they’re getting a Federal Subsidy from their friends in office. Then when the music stops, the owners close and take their money to the next politician who’ll grant them more money for a new project. Even with higher gas prices many state sales tax revenues are down because of the few number of people in the labor force. Many “long term unemployed” have gone on Social Security disability for being “depressed”, increasing Social Security spending at a time when the Social Security contribution for employees was cut, a very stupid move. SS will be running out of money much sooner. I wonder if Obama’s “laser like focus” on jobs can be compared to his “shovel ready jobs”? End point, just because he said it, doesn’t make it so. What do we have to show for the $6T added debt in 4 years? I conservatively expect Obama to end his reign (remember VJ said he’d be ready to rule on day one in his first term) with a $22T debt. It maybe even higher as Obamacare goes into effect. What will happen when the government can’t pay the promises it makes? I think it will make the street violence in Greece look like a bar brawl. With the dishonorable politicians (scientists, economists, business leaders, etc) we currently have, a bad end is more likely than a positive one. Having a populace that is so incredibly ignorant of economics, business and science doesn’t help, either. Bill Clinton’s tax rate was fueled by the dot.com explosion. His Federal Spending was only $2.8T, as well. GWB inherited a recession and his tax cuts got quickly offset by that inconvenient 9/11 economic slowdown. Things may get better, but I have a feeling it will be much worse before there is a real turnaround. What with fracking and all it looks like a flooding of the market is exactly what is happening. those pearly whites. For proof he told us to just look at the teeth of an alcoholic.